Coming up with full-fledged dinner ideas regularly can be a real challenge for families who want to keep their time at the dinner table interesting. Whether you belong to the Jewish faith or not, this recipe for Manuka honey-glazed Cornish hens with apples and cabbage presents a unique twist on the types of dishes often served during Rosh Hashanah, the Jewish New Year. 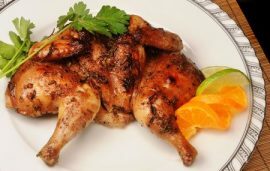 Using Cornish hens for individual servings, this dish will not only leave the family happy and full, but it will also offer something new and different. If you’re up for it, let’s get started! Preheat your oven to 350 degrees Fahrenheit. In a smaller sauce pan, melt 2 tablespoons the chicken fat (or olive oil) with the Manuka honey and black pepper. Take the glaze off the heat and then set aside. Divide the yellow onions along the bottoms of two larger baking dishes. Rub the Cornish hens down with the rest of chicken fat and then season them with the salt. Set the hens on the onions (four per pan). Roast the eight hens until golden brown and cooked through, which should take 25 minutes. Remove the baking dishes from your oven before brushing every hen with your reserved Manuka honey glaze. Raise the oven’s temperature to 425 degrees Fahrenheit and then bake the hens until deeply browned, with the juices running clear from the hens, which should be an extra 5 minutes. Set the hens aside for about 10 minutes before you serve them. Chop the scallions, reserving the dark green and white parts separately. On medium-high heat, heat the olive oil in a larger skillet. Throw in the garlic and scallion whites, cooking until lightly browned and fragrant, which should take 3 minutes. Add the Savoy cabbage, pepper, and salt, sautéing until the cabbage starts releasing juices, which should be around 1 minute. Add the water and cover, cooking until the cabbage has wilted, which should be around 3 minutes. Throw in the rest of the scallions, cooking, uncovered, until the water evaporates and the cabbage has become tender, which should be around 2 minutes. Preheat your oven to 350 degrees Fahrenheit. Combine the coconut oil, raisins, and sugar in a smaller bowl and then set aside. Core the baking apples and slice off the tops of each apple, roughly ¼-inch from the top. Using a spoon, a small knife, or an apple-corer, hollow the four apples gently, making sure to leave a 1/2-inch-thick shell. Fill in the apples with your sugar mixture. Set the stuffed apples into a greased baking dish, baking until the apples have browned slightly, tenderized, and been cooked throughout, which should take 25 minutes. Ladle the liquid from the bottom of the dish over the baked apples before you serve them. Enjoy your Manuka honey-glazed Cornish hens with apples and cabbage!